This looks very yummy!! I love breakfast, it’s my biggest meal of the day. Thanks Lisa. It’s very yummy. We made it just the other day and it’s good for you! Sounds good. I’ll have to try it sometime! Thanks Randy. You must let us know how you get on Randy if you manage to make it! 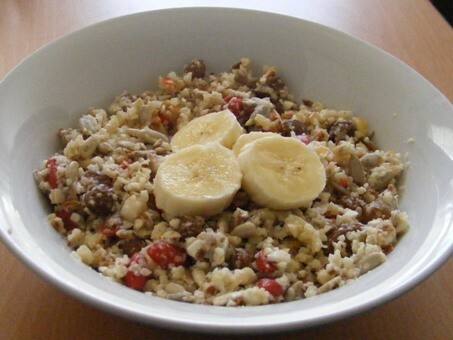 I have made a similar muesli to yours and added cinnamon and pecans and gogi berries. It is really surprising just how easy this is to make and it is so good for you too. No added sugar and low G.I. I had mine with yoghurt, as you’ve also suggested and it’s such a great way to start the day! 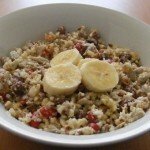 Yes it’s very easy to make muesli with different ingredients and still taste as good. You’re absolutely right, with no added sugar and muesli being low G.I. it’s more than a good start to the day. A good healthy breakfast. Can also be added to low fat yoghurt and berries, which will make it even healthier.